To login with your main campus credentials, simply click “Login with Network Username and Password.” Use your main campus login, the same one you use for Blackboard. 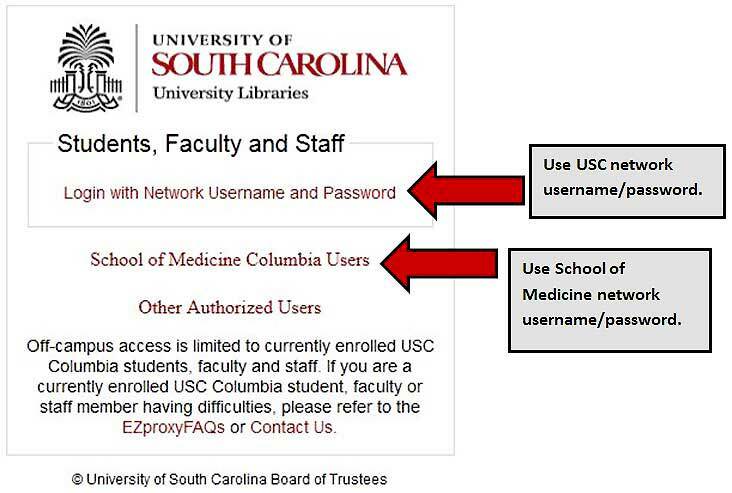 To use your SOM credentials, click “School of Medicine Columbia Users.” This will reveal a 2nd box in which you can enter your SOM network credentials, the same ones you use to check your “@uscmed.sc.edu” email account. If you have an e-mail account through the school, you can use your normal Microsoft network (or Outlook) username and password. Otherwise, please email libsystems@uscmed.sc.edu. See below for the answers to some frequently asked questions. Who can access the library's electronic resources? Anyone can access the library's resources during business hours at the library. However off campus access is limited to University of South Carolina School of Medicine Faculty, Staff, and Students using their Microsoft Network Login information (the same login used to check your email) or their University of South Carolina network credentials (i.e. Blackboard, Main Campus email, etc). If you are a member of one of the above groups and you do not know your SOM Network Login, then please contact the Office of Information Technology at 545-5100. To lookup your USC Network Credentials, login to VIP (vip.sc.edu) and click Technology. You should see “Network Username” as one of the options. Further, while the School of Medicine Library website is your portal for most Health Science Information at the University of South Carolina, there are many non-medical resources available through the University’s Libraries System. I'm a resident at Palmetto Health Richland, where can I find information about my login credentials? PHR Residents and Fellows may use their Palmetto Health Network Account to access the library’s electronic resources, the same credentials you use to check your palmettohealth.org email account. Where do I look to find if you have a particular journal? There are two answers to this question. For online journals the best place to search is the E-Journals link under "Find Resources" on the library's homepage. For print journals, search the library's electronic catalog, also available under "Find Resources". Why does x journal charge me when I follow the full text link from PubMed? Through its Linkout technology/program PubMed offers links to a variety of full text journals, books, and other resources. For many PubMed citations, if you view PubMed search results in "Abstract" or "Citation" view you'll see icons that link to the publisher/providers site to retrieve full text. In some few cases the link will be to free full text online, but most of these publisher/provider links will be to "pay per use" articles. You can very easily link to many of the library's electronic journals while searching PubMed. All you have to do is click the special link to PubMed under "Find Resources" on the library's home page or use the PubMed search box on the library's home page, perform your search, and view the results in "Abstract" view. For many citations, you'll see the following icons indicating either online access or print (of course for print you have to come to the library). If you do not see a garnet USC-SOM Online icon for an article you are interested in, select the Find Full Text @ USC School of Medicine Library icon to search for full text access. This icon will automatically search our e-journals database for you. If no full text is available from the School of Medicine Library, there will be a link to use to automatically search the main campus library, Thomas Cooper Library, for access. Do I have to start at the library's webpage to get off campus access? Yes. The library's proxy server only works with specially constructed links that direct the proxy server to route the traffic to specific sites. You have to use the links from the library's homepage if you are off campus. How do I suggest journals, databases, etc to the library to purchase? You can email the library staff at libsystems@uscmed.sc.edu to make general recommendations. The library has a print copy of this journal, why don't you have an online subscription? We inquire with all our journal providers whether they offer online access. When they do, we generally try and acquire this access. So for any journal that we have print but not online access it is either because 1) online access is not currently available or 2) the cost of the online access is too high.